Betty Cuningham Gallery is pleased to present all day, an installation of eleven new paintings by the New York based artist, Glenn Goldberg. This exhibition is presented in collaboration with Jason McCoy Gallery, NY and will run from February 28 through April 4th 2015. The artist will be present for an opening reception on Saturday, February 28, from 5 – 7:00 PM. All day features some of the largest work Goldberg has made, measuring up to 84 x 63 inches. 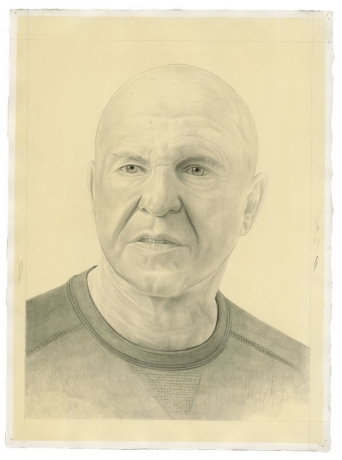 Related to his recent exhibition at Jason McCoy Gallery entitled Other Places (July 15 - August 16, 2013), all day continues Goldberg’s rendition of his signature vocabulary in a grisaille palette. Here, images of dogs, birds, or ducks, are woven seamlessly into ornamental landscapes rich in geometric detail. Decorative arts, rugs, banners, tapestries, Danish modern furniture, fetish figures, as well as ancient calligraphy are among Goldberg’s sources of inspiration, providing his work with a sense of varied cultural eclecticism. Goldberg’s compositions, consciously devoid of a narrative context, allow for the discovery of layered visual references ranging from the decorative arts to childhood imagination. The works are charged with a web of multiple dotted lines that delineate the space in rhythmic waves. The embrace of handmade imperfections continues to play an important role in this body of work. Glenn Goldberg has exhibited extensively in the United States. His work is in the collections of the Brooklyn Museum of Art, Brooklyn, New York; the Metropolitan Museum of Art, New York; the High Museum of Art, Atlanta, GA; the Museum of Contemporary Art, Los Angeles, CA; the National Gallery of Art, Washington, D.C.; the Nelson Atkins Museum of Art, Kansas City, MO; the Rose Art Museum Waltham, MA; the National Academy of Arts and Letters, New York; and West Virginia University Art Collection, among others. He lives and works in New York. The exhibition will remain on view through April 4, 2015. I’ve been following the evolution of Glenn Goldberg as a painter since I was exposed to his work in 1986. It was on the occasion of his recent exhibit All Day at Betty Cuningham Gallery (February 28 – April 4, 2015), in cooperation with Jason McCoy Gallery, that I was finally able to view his latest output, and to sit down with him afterwards on-site to catch up and discuss his work, and more. 8. 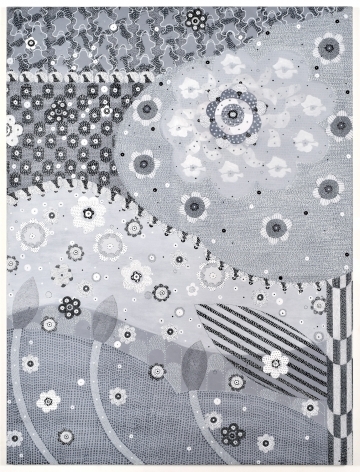 Glenn Goldberg at Betty Cuningham, through April 4. In “all day," a show of recent large-scale works, New York painter Glenn Goldberg, known as a consummate colorist, has, as he did in his previous exhibition, abandoned color altogether. Download PDF Click here for full article. BY STEPHANIE BUHMANN (stephaniebuhmann.com) | Featuring some of the largest work Goldberg has made recently, this ambitious exhibition continues the artist’s exploration of his signature vocabulary. Held in a grisaille palette, the latter consists of playful images of dogs, birds or ducks, for example, which are characterized by a graphic clarity reminiscent of billboard signs.